It’s something a lot of people probably think about – if I saw someone verbally attacking someone because of their race, sexual orientation or religion in public, would I react? Many of us have likely seen offensive behavior, silently fumed and said nothing. 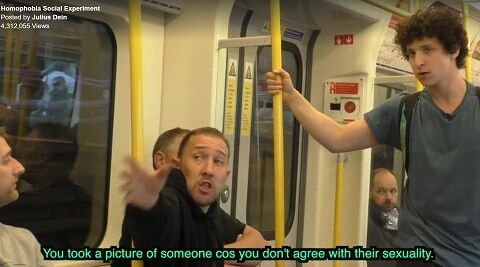 In this social experiment, Julius Dein, actors Adam Ward and Josh Green, and videographer Michael J. Needham test how people react to homophobia on the London Tube. The results may restore some of your faith in humanity after recent worldwide events.